We are proud to announce TWO of our members have made the trek to The National Retriever Championship November 10-17, 2018 in Kentucky. 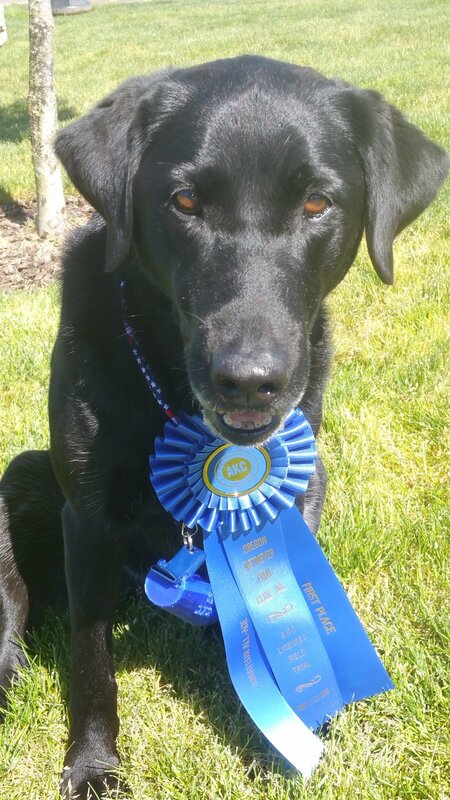 Kerry's Dude was a Finalist at the 2018 National Amateur Retriever Championship in Roseburg, OR. Kerry's Maddie wins the Chesapeake Retriever Club's Open stake on March 23, 2018. This gives Maddie her FC title and qualifies her for the National Open Retriever Championship. Kerry's Dude wins the Open at the NorCal Trial in March 2018. This gives Dude his FC title and qualifies him for both the National Open and National Amateur Retriever Championships. Rich Pingatore and Nitro qualify for the National Open. Kerry Lavin and Maddie qualify for the National Amateur. With much help from friends to prepare us, and with Dave Rorem's exceptional pre-national training assistance we, thankfully, made it through all ten series of tests. It was an experience of a lifetime! Dude earns a third place in his final Derby for a total of 32 points in 11 trials. He got second place in the Qualifying the same weekend. "Dise" 14 months old sporting one of his first place ribbons that put him on the Derby list.